Hiroshima is known the world over for the atomic bombing it suffered in 1945, but it has since bounced right back and the city standing there today is perhaps the nicest and friendliest in all Japan. The A-bomb museum and Peace Park are sobering reminders of what happened there and remain the main things to see in town, along with the Itsukushima Shrine on the nearby island of Miyajima famous for its torii gate standing in the sea and its gangs of overly-friendly deer. It’s possible to hit these main sites on a rushed day trip from Osaka/Kyoto or Fukuoka, but Hiroshima’s well worth staying a few nights to take your time and enjoy the local cuisine & nightlife. The city also has a constant stream of international tourists and a rugby team which competes in Japan’s 2nd tier, so while it isn’t hosting any matches there should still be a good atmosphere for watching them on TV. If you’re looking for a stopover en route between Fukuoka and the Osaka area, Hiroshima’s the obvious choice. Molly Mallone’s is an Irish pub on the 4th floor of the Teigeki Building in the main central shopping district with real pints and pub grub, which is both a good place to watch matches and a good place to kick off a night out. To be more specific, hotels near the Peace Park are good for sightseeing and those to the east of the park are also good for the nightlife in Nagarekawa. Hotels near Hiroshima Station are obviously good for ease of access and just a short tram ride from the Peace Park. 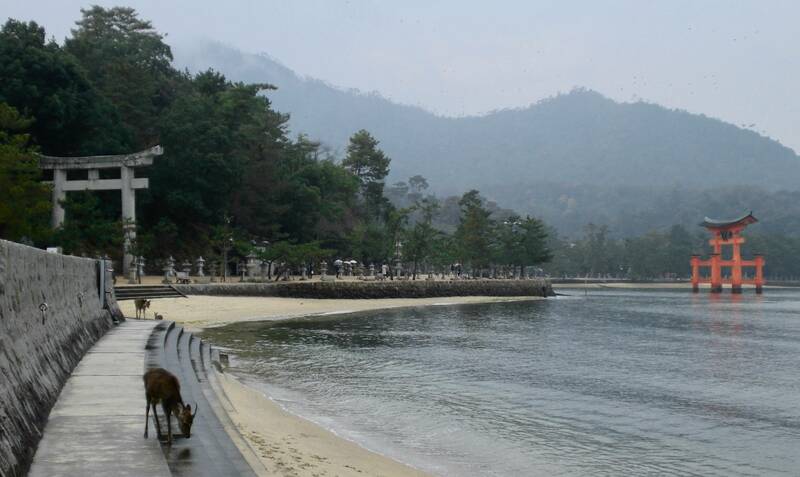 It’s also a nice idea to stay on Miyajima, search hotels on the island here. 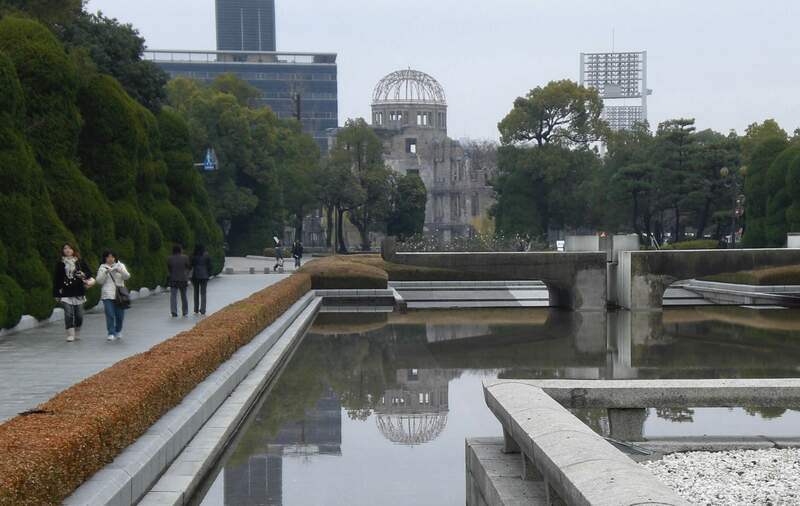 The A-Bomb Museum is one of the more harrowing museums you’ll ever visit, but it records one of the most significant events in human history and if you decide to visit Hiroshima there’s a good chance that’s the main reasom. 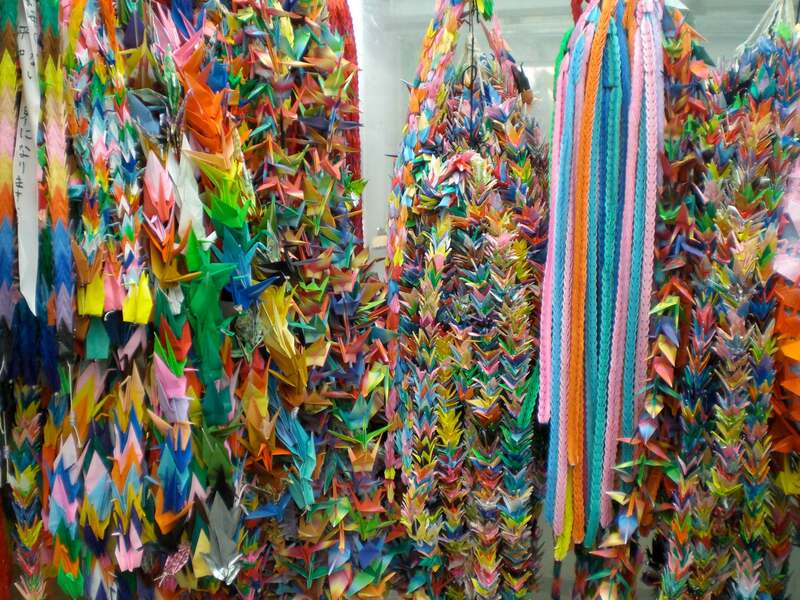 The Peace Park in which the museum stands also features the A-Bomb Dome, a government building still standing after the blast (the only building in the area to do so), and the poignant paper crane shrine in memory of Sadako Sasaki; it’s a place that will stay with you long after you’ve left Japan. 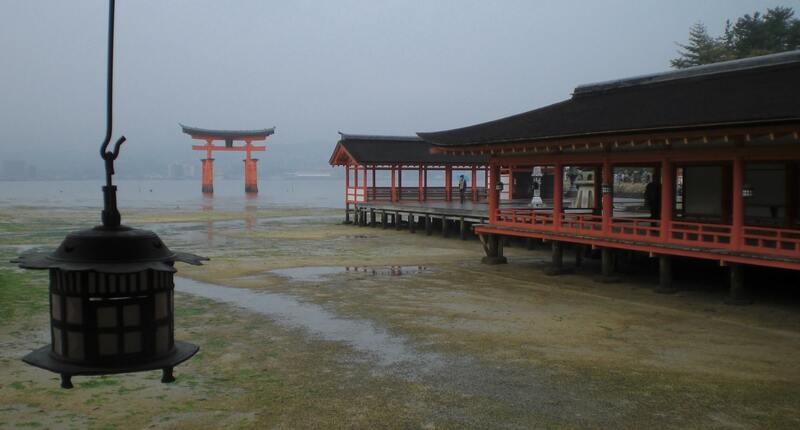 The island of Miyajima lies in Hiroshima Bay, home to Itsukushima Shrine and its famous torii gate standing in the sea. You can easily make a quick visit by tram & ferry from Hiroshima, though it’s also a place you could consider staying overnight. The Hiroshima Castle you see standing there today is a concrete replica dating to 1958, the original having been destroyed in the atomic bombing. It’s better to visit Himeji Castle if you can (or Matsumoto), but if that doesn’t fit with your plans Hiroshima Castle still looks the part. Between Osaka Castle and Hiroshima Castle (both modern replicas), Osaka Castle is the more impressive. There’s actually an entire building full of okonomiyaki eateries called Okonomimura (‘Okonomi Village’), a visit to which makes a great start to an evening out – conveniently it’s just around the corner from Molly Malone’s and Nagarekawa. The Nagarekawa area is home to pretty much all of Hiroshima’s nightlife, a bustling grid of sidestreets packed with all manner of eateries and watering holes. Most of the drinking establishments are squarely aimed at the local crowd – nothing strange about that of course, but it can be a little hard to work out for first time visitors. It’s a great area for wandering and people-watching in any case, so see what you can see and if you’re feeling adventurous dive right in somewhere. For a more accessible start to the night head to Molly Mallone’s and take it from there. Mac Bar – this local institution (a 5-minute walk west from Molly’s) is a tiny dive bar with a massive music collection (no, not the internet – actual CDs and vinyls), it’s been going for decades and holds legendary status. The main centre is very walkable with wide boulevards and plenty of pedestrian space meaning the crowds are nothing like the hectic parts of Tokyo or Osaka. The Peace Park and all the main shopping & nightlife are within easy walking distance of each other, and you can always jump on a tram if you can’t be bothered or its raining. You can use your IC card to ride the trams; the local IC card is Icoca (same as Osaka), and all the other IC cards are accepted too – see here for more on IC cards. To reach Miyajima, take the JR Sanyo Line to Miyajimaguchi Station (30 minutes) then take the ferry over (if you have the JR Pass it covers the ferry too); you can also ride the tram out to the end of the Miyajima Line (the final stop is near the ferry dock), but this is much slower (an hour or so, depending on your starting point). To get to Hiroshima you can jump on the shinkansen from Fukuoka (1 hour) or Osaka (90 minutes). If you’re using the JR Pass be careful not to board a Nozomi train as it’s not covered – take the Sakura instead, which is just as fast over this part of the network, or the Hikari which is a bit slower. You can also take the Sakura from Kobe (75 minutes). 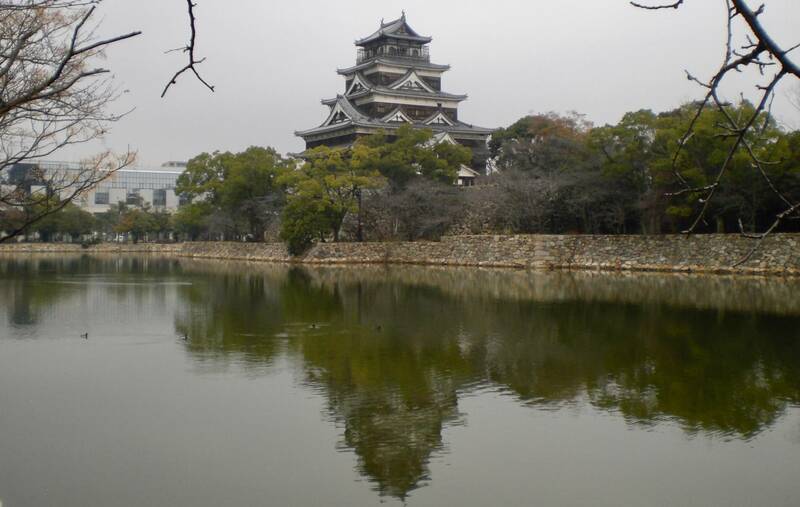 If you’re using the JR Pass also consider hopping off for a couple of hours to visit the castle in Himeji on your way through – Himeji-Hiroshima is an hour. Any questions about visiting Hiroshima? Give me a shout below and I’ll get back to you.